Thanks to Totally Tutorials and Scotch Duct Tape, a box of cupcakes and rainbows arrived on my doorstep last week. Who knew duct tape came in so many bright colors and patterns? The rainbow, blue and lime went to good use as a table cloth for my picnic table, but what to do with the pearlized pink and the cupcakes? I still had my mind on the sunshine, and I just bought a brand-new pair of sunglasses. I’m a little rough on them, throwing them around and setting things on top of them, so something to protect them was in order. I’ll be honest – when I started this project, I intended to make something to throw them in when they’re in my purse, but this turned out to be more useful on my dresser. The two rolls of duct tape I used were 5 yards each, and I had some of each left over. Cut pieces from the pink that are about 12” long (I goofed here - I’ll explain shortly) and lay them sticky side up until it measures 7”. Cut the same size pieces from the cupcake and stick them sticky sides together with the pink. Trim the ends even. Fold the front edge, which is one of the short ends, up 2” and crease. Fold the entire thing in half and crease. Fold the sides up 3/4” and crease. Fold the front up where you creased it previously, folding the corner in like you’re wrapping a gift. Use a small piece of tape on the inside and outside to hold the corners in place. Fold up the back, also folding the corners in. Cut 3” pieces of tape to fill in the sides, starting with the outside and repeating on the inside. Cut a 3/4” slit on each side of the back, even with the bottom. 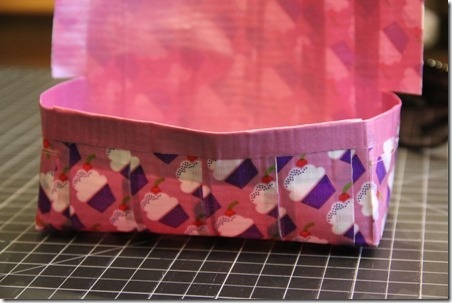 Overlap the top edge of the bottom section with tape. Cut off 3/4” on each side of the top. And this is where I realized the goof I mentioned earlier. When I initially cut my pieces, I only cut it 10”, rather than the 12” I instructed, so I didn’t have enough lid to close it. Fortunately, this is tape, so I was able to just stick on a bit more to make it as long as I needed. Overlap the edges of the top with tape. Fold and crease where the top meets the bottom at the front. I added a square of stick-on Velcro to the front of the bottom and inside the top. I thought I was done at that point, but I wasn’t very happy with the way the sides were bowing out. I realized I could tape popsicle sticks on the inside to keep them straight. I taped one full-length stick to the front and cut two shorter for the sides. It worked perfectly! This little box will be perfect for sitting on my dresser to hold my sunglasses and protect them from, well, me. I could also see using it for keys, jewelry or other miscellaneous items. 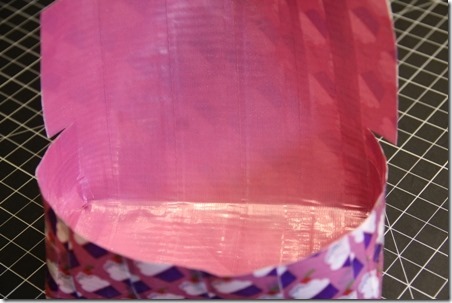 My thanks to Totally Tutorials and Scotch for letting me play with duct tape this week!